You must be aware of the fact that summers are incomplete without having lavish bbq parties with friends and family. Summer season is already here. So, are you planning for such parties? Though there are plenty of convenient ways innovated to cook food for outside gatherings. There are few options for electricity and gas facility too. However, you will agree that no one can beat the taste you can get from charcoal grills. Using a charcoal grill for bbq party don’t only gives fun time, but also makes you able to enjoy the awesome taste of smoked and perfectly cooked food. We’ll introduce you some of the best charcoal grills under $100 to make the BBQ party easy on the pocket. You must consider different factors before buying charcoal grills. You would have to compromise for one factor over another. That’s fine too. However, the price is a thing that usually gets the highest priority among all factors. So, here to ease your problem, we will discuss the best charcoal grill under $100 and $200. Why would I want a charcoal grill? Why is that, though? What makes a charcoal grill so special? How are charcoal grills made? 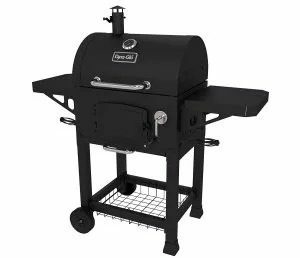 Is there anything I should know before buying a charcoal grill? How can I pick the best grill? This charcoal grill from Lodge firm is manufactured by using cast-iron. Its cast-iron grills are pre-seasoned to prevent rusting for a long time. Its dimensions measure 19 inches by 10-1/4 by 8-1/4 inches that are capable of accommodating a small group. It comes with adjustable tempers at two different heights. It helps to increase or decrease the temperature in the grill. This grill also contains a removable draft door that adjusts the heat inside the grill. This feature can offer you multiple cooking options. There is another flip door at the back side of the grill to access coals easily. Additional features include handle for convenient carrying, and built-in-shelf to keep other utensils during cooking. The grills are highly sturdy and made in hibachi-style. As far as its cost is concerned, it is a bit costly as compared to other products on the list. But, seeing all its features, it still worths your money. This grill can save your fuel, because of the option of accessing fuel through its backflip door. It is easy to maintain because of its removable parts. It can be carried easily anywhere. Whether, it is your patio, camping trip or any bbq party. It takes very little space because of its appropriate size. As it is made up of cast-iron, its grill can get rusted if kept without proper seasoning. Cleaning it can be slightly difficult, because of the absence of enamel. This Lodge’s charcoal grill offers portability, good quality material, ease of use, a different cooking option through varying temperature and fuel-saving feature. Though the price is a bit high, if the quality is your highest priority, then you should go for it. 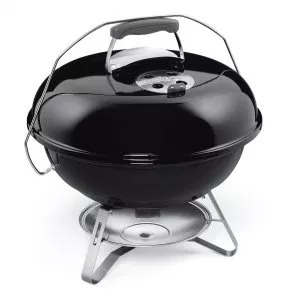 This Weber made charcoal grill is a kettle type grill that is particularly famous for its portability and simplicity. Weber 741001 Original Kettle grill offers a total area of 363 square inches for cooking. It can provide enough food for a small family. It’s cooking grate is made up of plated steel with a diameter of 22 inches. The size dimensions of this charcoal grill in 22 x 25 x 38.5 inches. It ensures indirect smoke with increased heat with the help of its airtight lid. You can clean it very easily. It contains aluminum ash catcher for this purpose. Its bowl and lid are enameled with porcelain material. This is the reason it can endure high heats and rough handling. It contains glass-reinforced nylon handles to provide ease of carrying it. It is probably the most expensive grill among your budget. It is very easy to clean with only a single touch, because of its aluminum ashtray. You can carry the grill easily anywhere through its nylon handles and light-weight. It can offer high durability and heat endurance because of its steel plating. It can offer you different levels of temperature adjustability through its upper and lower vents. It can’t serve in large gatherings because of its small cooking space. Having a reputable manufacturer for any product gives it extra importance. So this charcoal grill beside having this plus point offers portability, ease-of-use, and heat adjustability as well. Weber 121020 charcoal grill is one of the high portables charcoal grills. It contains a unique style with handles. That is too easy to carry besides looking adorable. Unlike common grills, it comes in rectangular shape cooking grate. It’s grill steel plated and offers 160 square feet area for cooking. It is unique in its style of tightening lids with its plated steel legs. That offers tension free portability. You can freely carry it anywhere through using one hand. Its lid contains glass-reinforced nylon handles to protect hands during cooking. It comes with two adjustable dampers that assist in controlling air flow for the better cooking experience. Each damper contains three vent holes to attain desirable temperature. It is made rust free and sturdy through applying porcelain enameling. Besides offering all features and manufactured by the renowned firm, it is quite low in its price as compared to other charcoal grills. 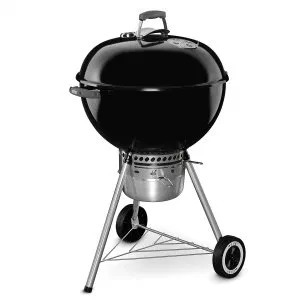 It is a highly affordable charcoal grill with extensive features. It can offer you more cooking space, because of its rectangular cooking grate. No assembly is required as it is one piece system. It can give you long lasting services, because of its heavy-duty grills. It might offer you less cooking space. As its legs are bit fragile, it can not carry more weight. This charcoal grill is lightweight, offers different heat adjustments, looks adorable and easy to operate. All its features are available at a quite low price too. This product is again from trustworthy Weber manufacturers. That’s why this Jumbo Joe portable charcoal grill offers durability and high tolerance against heat and high temperature. The cooking area is 18.5 inches in diameter. So, it is enough for a small family with short cooking time. It’s cooking grate is made up of sturdy steel material that lasts long even after enduring high temperature. It comes with aluminum made ash-catcher and dampers. This feature ensures its one-touch cleaning process. You can simply empty the ashtray by simply turning it over. There is no need to make your hands dirty through touching the ash. Its overall size dimensions after it’s assembled is 19.75 inches by 20.5 inches by 19.75 inches. It also comes with glass-reinforced nylon handles for easy handling. As far as its price is concerned, you can get it at a completely affordable price. It is rust-free and easy to clean because of its porcelain enameling. Besides its large cooking area, it has very lightweight that makes it highly portable. It has two vents with enough sized holes to ensure the optimum temperature inside the setup. It is a highly stable charcoal grill setup, because of its lid locks and handles. As it does not comes as a one-piece system. Therefore, its assembly can be difficult for you. This charcoal grill contains almost all features that you might need to enjoy a bbq party of the small group. The major plus is its lightweight and large cooking space. Char-Griller has a very good reputation for making up to the mark charcoal grills, and the 2-2424 Model says it all. 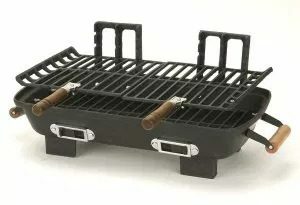 With its unique looks, it is a multi-purpose charcoal grill. Talking about its common uses, you will find it convenient and portable. It is constructed through using heavy-duty solid steel that ensures its durability and makes it able to withstand high temperature. It also offers ease of cleaning it up. As it contains removable ash pan, so you can clean it by taking it out. Its cooking area is made up of cast-iron and offers 250 square feet of area for cooking. It is a multi-purpose grill. 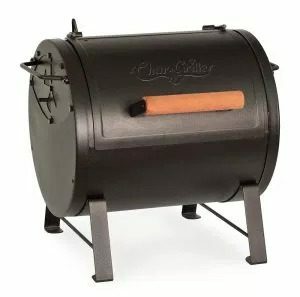 You can either use it as a separate grilling system or can attach it with other barrels to make it Side Firebox. Besides its all versatile features, it is available in a very average price range. It can serve the purpose of both table top grill and Texas-style smoking. Because of its adjustable style, it can be attached to various models of Char-griller barrel grills. It offers enough size for cooking with its large cooking grate. It is easy to adjust its temperature and to save fuel because of its feature to access coals easily. It can be slightly heavy for you, as it is 39.4 pounds in weight. Once you convert it into side firebox, you can’t get your table top grill back. 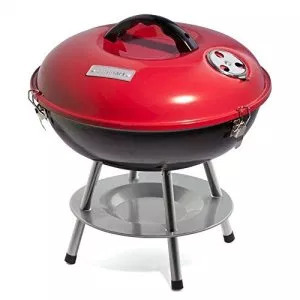 It is a unique style and good quality charcoal grill. If you want to purchase a multi-purpose charcoal grill in the average price range, then this grill should be your pick. 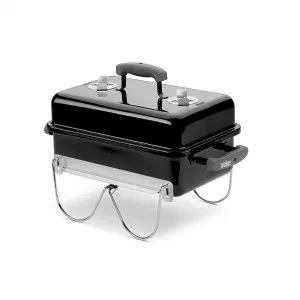 Marsh Allen 30052 is a portable small-sized charcoal grill. It can easily cook the food of four people. The cooking surface this grill offers is 157 square inches. Its grills are made in hibachi-style with cast iron material. It contains adjustable grids, to adjust the temperature of heating of the grill. These grids are located at three different parallel positions. Therefore, you can adjust the distance of coals with your food at three different temperatures. Additionally, it’s cooking grate also contains a wooden handle that makes them easy to handle. Though it is an open style charcoal grill; there is the possibility of food to come out of it. However, to avoid this thing, the grids are slightly curved in an upward direction. It also contains two vents to control the burning rate of coals. It is available in a very nominal price range. You can afford it easily. It can offer you the various cooking option with varying temperature, because of its three adjustable grids. Though it is open style, very light in weight making it easy for you to carry anywhere. It can be very sturdy and durable grill option, because of its cast-iron grills. It can be slightly difficult for you to clean it up, because of its rough surface. As its material is cast-iron, it might get rusted if not seasoned. With its lightweight, adjustable heights and low rates, it can be a good grill option for you. However, its drawback can be its difficult cleaning. This charcoal grill is again Weber’s product. So, no doubt is left for its durability and high-quality features. This 441001 Original Kettle-style grill is extremely portable with its 240 square inches of cooking area. 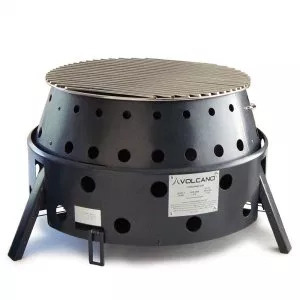 The cooking grate comes with steel plating, with a diameter of 18.5 inches. It comes enameled with porcelain to make it sturdy against high temperature. Its lid and bowl style gets tightly closed to store heat inside for slow and indirect food cooking. It is made easy to clean through its aluminum ash-catcher and aluminized steel material. The size of complete setup is 18.5 inches long, 23 inches wide and 35 inches in height. As it is made up of a renowned manufacturing company and also contains exceptional features and quality. Therefore, its price is a bit high as compared to those listed charcoal grills that are manufactured by other companies. Webber is a very convenient to grill because of its innovative style. It can withstand very high temperature and can last longer. The grill offers high portability due to its lightweight. It can give you a very good taste of your food, because of its traditional style cooking mechanism. As the grill grates are not hinged, it might get unstable during cooking. It assembly might take you enough time. This charcoal grill can give you benefits of portability, heat adjustments, durability, and perfect taste. Though its price is a bit high, it’s exceptionally good features deserves it. You have gone through the list of many charcoal grills, but this one will drop your jaws. This Cuisinart CCG-190RB Charcoal Grill is a unique grill among all. It’s 14 inches chrome plated cooking grill offers 150 square inches of cooking space. It is extremely sturdy because of its enamel-coated firebox. Moreover, it contains a dual vent system for temperature management and tight lids. Cleaning as well is easy. However, despite all these features, this whole charcoal grill system weighs only two pounds. It can accommodate a small family easily with fast cooking. Like its weight, its price range is also the lowest among your budget. It is highly durable, able to withstand high temperature. Because of its lightweight, it might get unstable during cooking. It is not good for large gatherings. This one charcoal grill is suitable for all those fellows who need some seriously economical and lightweight option for their camping or other outside trips. A charcoal grill is a magical thing that can elevate the fun and taste of your food. However, plenty of different options is available on the market. Here, we have discussed the best charcoal grill under $100 to make your choice of grills easy. You have seen different charcoal grills offer different features and buyers have to compromise on others. No one grill can fit for all types of users. Each has its pros and cons. 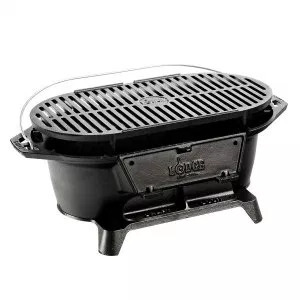 However, considering lowest weight and lowest price grill with good quality, Lodge L410 Sportsman’s Charcoal Grill wins, and considering extensive features and large size, Char-griller conquers the trophy. Grilling’s become more than a way to cook food. It’s become a sport to some people – a lifestyle – and a grill master takes their grill and their food seriously. There’s a lot of different grills out there on the market, and they all have different features – the pros and cons that decide whether a grill is something to take home or something to leave at the store. Unfortunately, it can be difficult to choose a grill based on what you see at the store. There’s just not enough information available about the different brands. That’s why we’ve taken some of the best grills on the market, sifted through them, and determined the best choices that you could buy today. There’s a lot of reasons that you might want to invest in a charcoal grill. Charcoal has been a popular method of cooking for ages – particularly for cooking meat, like steaks. A charcoal grilled steak conjures up great memories for lots of western people, and charcoal fans will claim that a charcoal grilled slab of meat tastes better than anything else you could cook. A charcoal grill has a metal box with a grill in it and a bed underneath where you lay the charcoal. The charcoal is heated up and the heat from the charcoal warms up the grill, which, in turn, heats up the steak. That’s why you get the iconic grill marks on your steaks when you cook on a charcoal grill. Since you’re using charcoal, some of the smoke rises to cook the steak as well. This is part of the reason that charcoal cooked steak has a different flavor than what you’d find with gas grilled or pan-seared steak. Another reason that people love charcoal grills is that they’re fairly cheap. There are a lot of charcoal grill models that are much less expensive than similarly sized gas grills. Charcoal itself is much less expensive than gas, and it lasts quite a long time. It’s important to know how a charcoal grill’s built so you can understand what features to look for and what to avoid. Most charcoal grills follow a basic formula, so you can expect to find the following things on pretty much any grill that you buy. They have a bed where you place the charcoal. Smaller versions don’t allow you to add or change the charcoal during grilling; some bigger models do. They’ll have a grate for you to put food on. The metal that composes the grate differs between some different models. There will be vents to funnel oxygen in and out of the grill – without this, the embers wouldn’t stay lit and you’d smoke your food out. That’s basically what you’ll find in any charcoal grill. The important part and the reason that grills are differently priced and appeal to different people is the differences. Different grills heat up to different temperatures based on the thickness of the grate and the amount of coal you can fit. Different grills allow you to raise or lower the grate so you can adjust the heat so it’s direct or indirect. The size of the grills varies immensely, so you can cook different amounts of food on different grills. This also affects the price and the ability for the grill to heat up quickly and evenly. Grills can be made of different metal which affects the heat distribution. Some grills have additional pieces, like smokers, that can provide an additional option for people who like food cooked in different ways. To ensure that you get a quality grill, you need to assess what you want out of a grill. Do you want to cook for a lot of people? Do you want to cook your food quickly? Do you want slow-seared steaks and the ability to smoke your food? Figure out what you want, then check out the specs of your grill. You’ll have to be careful, though – you can’t expect to buy a grill with all the best features and components for under two hundred bucks. This is where you’ll have to balance your budget with what you want. 1. Temperature control. This is important for people who want to be able to cook and perform other tasks, or people who are extremely concerned with the speed with which they cook. 2. The quality of the dampers. These are your intake and exhaust vents, and they need to be tightly secured for proper ventilation. 3. This allows you to lower and raise the grate for different levels of heat and different cooking speeds, by changing the heat from direct to indirect. Adjustable grills tend to be a bit more expensive than non-adjustable ones. 4. 2-zone cooking space. A good cook uses the grill to cook food in the main area, and sections off a smaller area to store food that’s cooked to keep it warm. If the grill can’t fit both of these areas, you might want to reconsider – unless you’re cooking for smaller groups. 5. Ash removal systems. These aren’t really necessary, but they make it a lot easier to clean your grill. Once you’ve figured out what you need, you can start looking in greater detail at your grill and the specs that it has. Pick out what you want most and prioritize these features above anything else, so you don’t end up paying for a feature you don’t need. Charcoal grills are awesome, but they come with their drawbacks, and it’s important to be safe when you’re using them. Charcoal grills aren’t as clean for the atmosphere as electrical grills. They produce smoke which can be dangerous, especially if they’re used in a ventilated area. Charcoal grills aren’t as clean for the atmosphere as electrical or gas grills. They produce smoke which can be dangerous, especially if they’re used in a ventilated area. It’s important to make sure that you take fire caution when you’re using a grill. 1. Wear appropriate gear – gloves are recommended since you’re dealing with flame. 2. Make sure your utensils are appropriate – you need long brushes and tongs to avoid burning yourself. 3. Make sure your utensils are well maintained, otherwise bits of brush might break off in your food. 4. You need to change the charcoal in your grill periodically, otherwise, it loses its efficiency. You don’t want to do this too often, though, otherwise, you’ll run up a bill. Charcoal grills aren’t as easy to use as gas grills, which allow you to just flip a switch and start grilling. You might get dirty changing the coal, and it takes a bit more physical effort to use a charcoal grill. However, most charcoal grillers will contest that it’s worth it to get that flavor. Once you’ve determined what you’re looking for in a grill, it’s time for you to start sifting through the different grills that are available on the market. There are a lot of things to check for. It can be quite a time consuming trying to pick out a good grill in person – often, store employees aren’t specialized in grills and you might end up having to go from store to store. Another reason it might be difficult to find a cheap charcoal grill is that many stores stock products with the most bells and whistles. You may have to look to a specialty store or find a grill on sale to find one that matches your price range, and you may have to sacrifice a few features. Fortunately, we’ve rounded up the best overall grills that are available on the market right now. These grills are all under two hundred bucks and maintain the best number of features for their prices. This is a good, family sized grill that runs you between one and two hundred dollars. It’s stainless steel and circular – a traditional looking grill that you might see at a camp cookout. This design is what most round grills were based on – Weber pioneered the design in the fifties. This means that a grill from Weber will last you a long time. The grate has 363 inches of cooking space, so you can fit a couple of dozen burgers on it. The lid’s high enough to accommodate turkeys and roasts. The built-in temperature gauge isn’t known for being reliable, though. Weber uses a reliable design that’s been duplicated ever since its reinvention, so you know you’re getting a durable grill. It’s big enough to cook for a family. You can cook all sorts of food here, from steaks to turkeys. The grill’s on a two-wheel system so it can be leaned back and rolled for easy transportation. You’ll have to buy your own thermometer because the built-in temperature gauge isn’t reliable. Some might find the two-wheel system inconvenient. This stove is the definition of convenient. It’s great for people who plan to go camping, or who only grill on special occasions and doesn’t want to have a grill taking up tons of space on their property. This grill also comes dual compatible with propane and wood, so you don’t have to use charcoal as your only fuel source. This makes it extremely versatile – you can fuel it with wood you find in the forest at your campout. An extremely versatile grill that can be used anywhere. It can be collapsed and easily transported. Doesn’t rely on a single fuel source, making it convenient for when different types of fuel are on sale. Has a fairly small grill space since the entire thing’s collapsible. Won’t maintain as much heat for as long as other grills. This is another great grill for folk who like to take their Barbie out for trips. The grill has tight grates, so you don’t have to worry about food slipping through. It’s not collapsible but it’s small enough to be easily transported. The grill comes with two separate cooking speeds that can be easily switched between. This grill’s small and can be moved from location to location quite easily. A strong sturdy grill ensures that your food stays safe from being burned. The draft door can be opened or closed to further adjust temperature. It cooks with much more effective than other portable grills. The small size doesn’t appeal to people cooking for large groups. Two cooking speeds might not be enough for some people. This grill certainly doesn’t look like it would come in under two hundred bucks. It’s large, made of solid metal, and is super durable. It has two cast iron grates that total 568 square inches of cooking space, making it more than sufficient for cooking for large groups of people. You won’t have to worry about these grills breaking or wearing out, either. Large cooking space holds food for lots of people. Adjustable grates help you control your cooking speed and temperature. The model is sturdy and won’t fall apart easily. The metal is thin and can lose heat quite easily. The airflow is not the best and can compromise cooking quality. The best of the best is probably the tried and true Weber’s original grill. It may not be portable for long distances, but it’s easy enough to roll around your back yard, and people who are looking for a grill to just cook food aren’t necessarily in need of one that collapses. Weber has been making grills for years and is one of the pioneers of the market, so their products are known for their quality. It may not be portable for long distances, but it’s easy enough to roll around your back yard, and people who are looking for a grill to just cook food aren’t necessarily in need of one that collapses. Weber has been making grills for years and is one of the pioneers of the market, so their products are known for their quality. This grill holds a fair amount of food so it can cook for groups, but it’s small enough to not be considered bulky and unsightly. For the price, this is pretty much as good as a cheap grill can get. This grill holds a fair amount of food so it can cook for groups, but it’s small enough to not be considered bulky and unsightly. For the price, this is pretty much as good as a cheap grill can get. Now that you’ve been able to read about some different grills, you’ll be able to make a better decision as to which one you want. Normally, this can be quite the procedure, but hopefully, our research has narrowed down the selection for you. Happy grilling!